In humans, porphyrins are the main precursors of heme, an essential constituent of hemoglobin, myoglobin, and cytochrome. Deficiency in the enzymes of the porphyrin pathway leads to insufficient production of heme. This is, however, not the main problem; most enzymesâ€”even when less functionalâ€”have enough residual activity to assist in heme biosynthesis. The largest problem in these deficiencies is the accumulation of porphyrins, the heme precursors, which are toxic to tissue in high concentrations. The chemical properties of these intermediates determine in which tissue they accumulate, whether they are photosensitive, and how the compound is excreted (in the urine or feces). 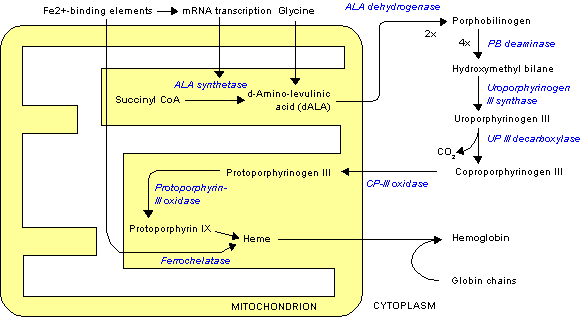 There are eight enzymes in the heme biosynthetic pathway: the first and the last three are in the mitochondria, while the other four are in the cytosol. Variegate porphyria (also porphyria variegata or mixed porphyria) results from a partial deficiency in PROTO oxidase, manifesting itself with skin lesions similar to those of porphyria cutanea tarda combined with acute neurologic attacks. It may first occur in the second decade of life; there is a cohort of sufferers living in South Africa descended from a single person from the Netherlands, Berrit Janisz, who emigrated in the 17th century. The hepatic porphyrias primarily affect the nervous system, resulting in abdominal pain, vomiting, acute neuropathy, seizures, and mental disturbances, including hallucinations, depression, anxiety, and paranoia. Cardiac arrhythmias and tachycardia (fast heart rate) may develop as the autonomic nervous system is affected. Pain can be severe and can, in some cases, be both acute and chronic in nature. Constipation is frequently present, as the nervous system of the gut is affected.